Turkey is rich in archaeological sites, historical monuments and an enormous variety of spectacular scenery. A coutry partly in Europe and partly in Asia. I stayed in Istanbul, watch belly-dancing, visited Ottoman Palaces, The Blue Mosque of Sultan Ahmet, Basilica of St. Sophia, Byzantine Hippodrome, then travelled to Pergamon's ancient kingdom including the healing center, the Acropolis, magnificent Ephesus, Library of Celsius, Virgin Mary's stone cottage, Pamukkale with its fantastic white line cascades, Antalya's amazing ancient cities Perge and Aspendos Theater, Cappadocia's unique landscapes and underground cities, underground city of Kaymakli, Turkey's capital city of Ankara. 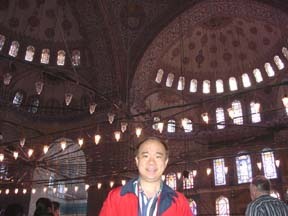 The Blue Mosque of Sultan Ahmet was built in the 17th century, which is famous for its impressive ceramic tiles. 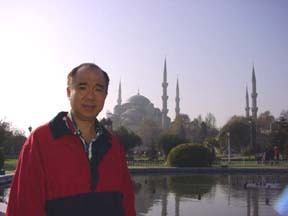 It is called the Blue Mosque because of the blue color of the dome inside. Byzantine Hippodrome area was the site of Roman Byzantine chariot races. To enter the Mosque you are requied to remove your shoes, bring a plastic bag to carry your shoe. If you don't have one there are loaner but they are not so clean. Women with short skirts (above the knee) or short need to be cover up. The Mosque provide cloth for the covering. 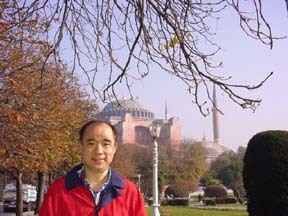 Next to the Blue Mosque is the St. Sophia. In Istanbul you got to go to the Grand Bazaar, a covered market of over 4,000 shops, where you can find gold chains, gold bracelets, copper and brass wares, carpets, leather coats and jackets at bargain prices. Originally the Church of Divine Wisdom, then converted to Mosque and now it is a Museum. 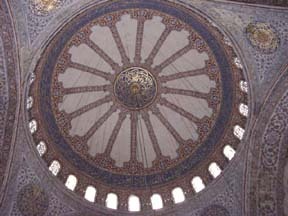 St. Sophia is located opposite the Blue Mosque. Nearby is the Spice Market where you can find all kind of Spices, Turkish Delight (candy), nuts, dates etc. Turkey is known for the exotic Belly Dancing especially in Istanbul where Belly Dancing is the night time extertainment. Click the Belly Dancer Maria and watch her belly dance. Belly Dancing usually comes with dinner and drinks. Usually two or three belly dancers perform during evening dinner shows. Highly recommended during you visit to Istanbul. Kusadasi is one of Turkey's best-loved Aegean resorts. This port city is one of the most favorite port of call for major cruise lines. Cruise lines dock here for visiting the astonishing ruins of Ephesus, where 250,00 souls (including St. Paul and the Virgin Mary) resided in a city that once rivaled Rome. Ancient Pergamum's acropolis, home to the Altar of Zeus and the Roman medical center of Asclepieion. 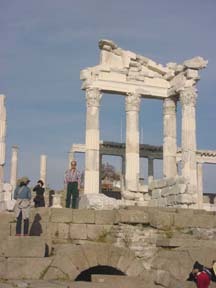 Pergamum is close to the city of Izmir. Ephesus is one of the most important city in antiquity the capital of Roman Asia Minor, one of the world finest archaeological museum. Ruins of once-great buildings and site of St. John's Basilica, where the Apostle is buried. Walked down the 2000 year old marble street the colonnaded Arcadian Way leading to the library, brothel, temple and a huge amphitheater. 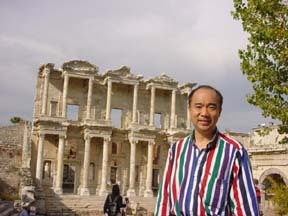 The splendid facades of the Library of Celsus is the largest and most impressive structure to survive from the Hellenistic Ephesus. Archeologist found a tunnel just infont of the Library leading to the brothel across the street. You have to go see for yourself, the prostitutes are not around anymore but their advertising sign carved on the marble sidewalk is preserved. Pamukkale, the Cotton Castle, a huge white limestone terraces and cascades in scallop-shell basins with glistening pools. 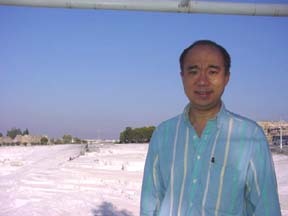 Hot spring water cools by mountain air resulted in the formation of limestone cascades. 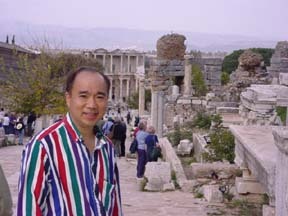 Perge and Aspendos are two amazing ancient cities in Antalya area. 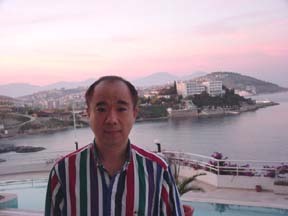 Antalya is a popular vacation spot for many european, like the German, French, to enjoy the warm climate of the Mediterranean. 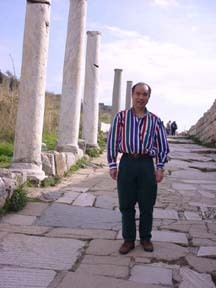 Perge with its colonnade street is another Helenistic and Roman ruins. 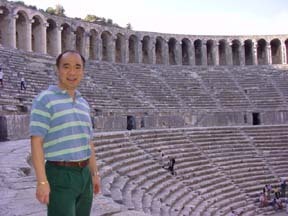 The Aspendos theater is one of the best preserved Roman Amphitheater and holds 15,000 spectators. This area is known for their carpet. You can get wool on cotton carpet, wool on wool and also silk (silk on silk) which is the best and most expensive. 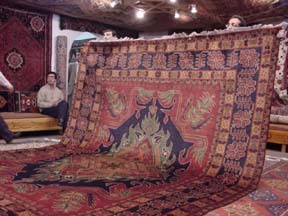 The carpets in this area are made with the double knots technique, which makes the carpets more durable. The double knots carpets are more difficult to make and worth more money. On the top photo, the lady has just completed the carpet and she was cutting it off from the loom. The showroom contain thousand of carpets all sort of sizes and different pattens. Capadocia is known for the fine quality pottery. 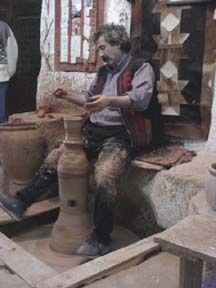 This is a picture of the Pottery factory's owner, who is also an pottery artist, making clay pot. 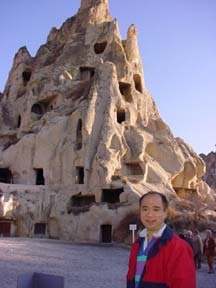 Kaymakli, the eight-story underground city. In the primitive times, inhabitants carved out the soft volcanic rock to create underground dwellings that eventually grew to become entire cities. 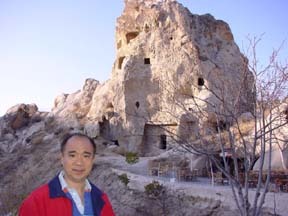 The early Christians even carved elaborate churches out of the porous rock including the Chapel of Goreme 6th-10th century rock. Travelled on the 13th century caravan inn used in those day by the camel, enroute to the moon-like landscapes. 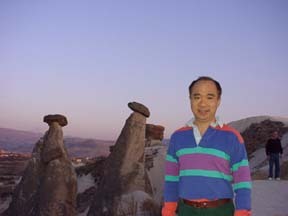 The moon-like landscapes of Cappadocia, a landscape of unusual rock formations called "fairy chimneys". These unusual landscape of Capadocia, make this region the most favorite area to visit. The is also the wine region of Turkey. Ankara the capital of Turkey. 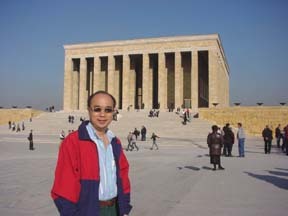 This is Ataturk's Mausoleum. Ataturk is the founder of modern Turkey. The next buildings are the Museum of Anatolian Civilizations with its Hittite treasures. Food: Turkish Cuisine - the cross-roads of the Far East and the Mediterranean. Great yogurt, fresh cucumber, nice vine ripe tomatoes (especially in Antalya), all kinds of egg plant dishes, plenty of olives, shish kebabs (lamb or chicken), fantastic baklava deserts and famous Turkish coffee. Moslems are forbidden to drink alcohol, but most western hotels, bars and restaurants usually serve a full range of spirits and wines. Pork is generally not available because Moslems are forbidden to eat pork. You too can shop at the Grand Bazaar (lether jackets), tour the Roman Hippodrome, visit the 17th-century Blue Mosque, see the world-renowned ancient library and be a the house where the Virgin Mary spent the last days of her life by joining this 13 days Escoted Tour Gems of Turkey.